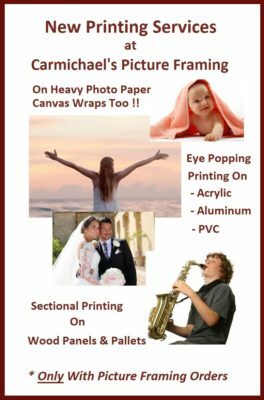 Printing Services For Custom Picture Framing Projects - Carmichael Inc.
We offer our customers printing services for custom picture framing projects. So now you don’t have to take time to get prints made before visting the frame shop. Just provide us a digital picture file and we’ll take care of the printing as well as the framing. IM Graphics Group is a division of International Moulding and currently has 20 locations in the US. What Kinds of Printing Services For Custom Picture Framing? Canvas – A poly cotton blend canvas that will be durable, fade resistant and brilliantly beautiful! Use canvas to frame, or create a gallery wrap with 5/8”, or 1 3/8” stretcher bar. Acrylic – Seeing a print on Acrylic is a truly eye-catching experience. Extra Vivid Printing using quality materials with 1/4″ depth will make your photo or print really stand out. IM Graphics uses 1/4″ and 1/2″, 99% optically clear acrylic. When your print is individually cut, the edges turn out clear and polished. PVC – Clean and Crisp printing on durable substrate that can be used in a variety of ways. This material is very unique and offers endless capabilities; these photo quality graphics are durable, withstanding daily use and damage. Available in varying thicknesses 3mm-20mm. Aluminum – For a great piece of artwork like you’ve never seen before, try printing on aluminum. Printed directly on substrate 3mm, ACM, white coated. Your print will take on a shine that is not possible with traditional materials. This material is lightweight, rigid, and extremely durable: great for indoor and outdoor art. For a beautiful, unique look, try brushed aluminum ACM. Wood – Print photos directly on wooden boards or mini pallets. When printed on wood, the natural tones and grain of the wood really create a unique and beautiful effect. Wood prints help accentuate an room and give a rustic feel to even the most modern home. Durable and lasting, wood prints have the longevity to endure on the same wall for years, through multiple moves, or as a gift passed down through the generations. Wood prints make for great outdoor decorations!